Earplugs make everything quieter. I awake in my tent on the lawn at Callahan’s. That's a good thing because this is where I fell asleep. It seems quiet, until I remove my earplugs and listen to the sounds of the trucks going by on interstate five. They rumble past nonstop day and night. It's now early morning, my normal waking time. It's so nice here. Cool and flat. My tent is far from the other ten or so tents so I don't hear other Thru-hikers rolling around on their sleeping pads. I deflate mine as that seems to be the triggering event for the start of my mornings. Pfffssssssssss. Welcome to a new day. I make my granola, instant breakfast, Starbucks caffe mocha combination. It saves fuel and I actually like the taste of coffee in my granola. I grab a few apricots and then pull out my snacks for the day. I already have them separate from my other snacks. In my pockets they go. I transition from sleeping mode to hiking mode through a number of steps. I only remember them one at a time. It's always the same every morning. Today though I will empty my trash before heading out. I also need to return the towels I got as part of my package deal. I stop by the shower-laundry and do both. Then I head out of the parking lot, back under the freeway, and up the access path back to the PCT. It's early, my favorite time for hiking. My new shoes are feeling good. They seem to be doing a great job supporting my feet. The trail goes along the road under interstate five. I follow the road for a mile until the trail leaves it and heads off into the forest. It's always an adventurous feeling to walk off the road into the forest along a trail knowing that I won't be coming back this way. Where will it lead? What will I see? The trail follows ridges in grassy oak and pine forests. There are strange volcanic rocks jutting out from the grass. The trail roams slowly across the ridge trying to do its best not to discourage me, unlike California. In Oregon the trail is different. Like it wants me to succeed. It climbs, but levels out before I think it will. Like it wants me to not give up. I hike for hours in the pine forest along the ridge. 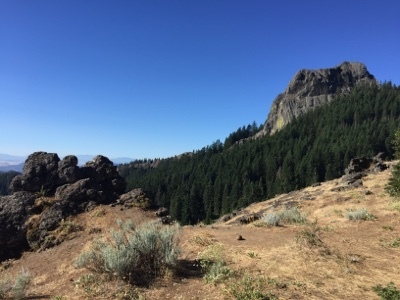 Maybe it's because Oregon has fewer jaw dropping vistas and they toned down the trail to keep hikers going. I keep going. It's hot, more than warm, at least in the sun. There is a lot of sun on this part of the trail. Dry and dusty too. On and on I hike. The water is scarce so I measure and plan accordingly. My plan was to camp at the Hyatt Lake PCT Camp. I check it out by hiking about a quarter mile off trail. It's a campsite surrounded by other campers. Car campers with smoky fires. The restrooms and showers are tempting, but why pay two bucks to camp here when I can camp for free on the PCT. I don't need a shower I had one yesterday. It's decided. I leave and hike back to the trail. I hike on to the water spigot conveniently installed at the trail at the edge of the campground. I drink a liter and get two and a quarter liters to go. That is enough for dinner and breakfast and a little extra for hiking to the next water source. It's getting late, actually way past my arbitrary mental stop time of fourish. I've been hiking for a while now looking for a place to camp. The maps don't show any campsites in this part of the forest. I can now see why. This is a ‘working’ forest. The trees have been cut back and clearer so there's lots of space between them. The space is filled with tree limbs and trunks. Pieces of trees that will eventually decompose and make great topsoil. Right now they make it hard to camp. I hike some until I spy a big open site down the hill. It looks like an empty group site. I head down and find a great place to camp. Off the trail so I won't be burdened by hearing hikers pass by. When I camp too close to the trail it stresses me out when I hear other hikers go by. I feel like I need to get moving. Now I won't hear them. Out of sight, out of mind. down in this empty campsite it's quiet. I am alone, far from any campers. Next to a barely flowing trickle of water. The mosquitos seem to like it. The last rays of sunlight slant horizontally through the trees. Bugs, mosquitos mostly, some bee-like insects too, fly lazily in the sun’s last glimmering rays. I cook dinner sitting on a chunk of log I rolled to a convenient spot near my tent. A small slather of repellent keeps the mosquitos off me. It's somewhat eerie sitting in a forest by myself. I keep turning my head and looking behind me, expecting to see a mountain lion ready to pounce. Nothing, no one. I'm glad to finish eating and my chores and isolate myself away from all this wild nature by a few mils of fabric by climbing in my tent. It's delusional to think of this as any protection from marauding predators, but it's a happy delusion that helps me sleep. I fall asleep before the final rays of the sun flicker out and remember nothing.